Reading 'super-sub' Adam Le Fondre is happy to continue in his successful role as substitute after being voted Premier League player of the month. 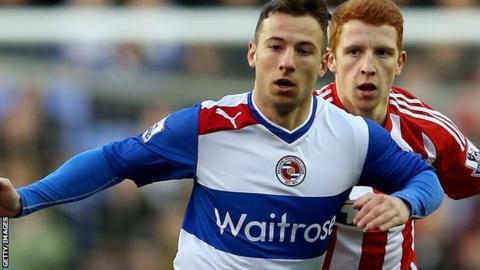 Le Fondre has come off the bench to hit five goals in his last four league games and help Reading climb out of the top flight's bottom three. "I'm buzzing," said Le Fondre, ahead of Saturday's trip to Stoke. "I'm scoring goals and I just want to start games. "But it's about the team at the minute," he told BBC Radio Berkshire. "It's been a fantastic month for me and I hope to build on it. "It's been surreal for me," added Fondre, 26, signed from Rotherham United in August 2011. "Two years ago I was at Rotherham, but I welcome the pressure and the expectation. "At the minute, the shape we play does not facilitate me playing so I'll just have to wait and see." Le Fondre has not started a league game now since the 3-0 defeat at Sunderland on 11 December, manager Brian McDermott having preferred to play with Pavel Pogrebnyak as a lone striker. "We need to be more solid, as a 4-4-2, before I start," said Le Fondre. "It's not my decision. It's the gaffer's and, when he sees fit to use me, I'm there when needed." Le Fondre is currently ranked joint ninth in this season's list of Premier League top scorers, having hit 10 goals in his first campaign in the top flight - the last six of which have come via the bench.